Looking for a present for someone born in November? 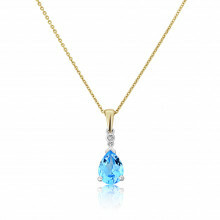 Look no further than this stunning aqua blue pear drop topaz pendant. Set and threaded in white gold and complimented by a single white diamond. This is a really special item.